When I first saw the post on the New York State listserv about the Hooded Crow on Staten Island I wasn’t going to twitch it. Why? It had to be an escaped bird or at least one that didn’t make it to the southernmost borough in New York City under its own power but by riding a boat. * After all, Hooded Crows are a bird of eastern and northern Europe, Central Asia, and the Middle East and are not known as long distance migrants. But the more I thought about it the more I wanted to see a Hooded Crow again. My last encounter with a Hooded Crow was in May of 2009 in the Tien Shan Mountains of Kazakhstan. 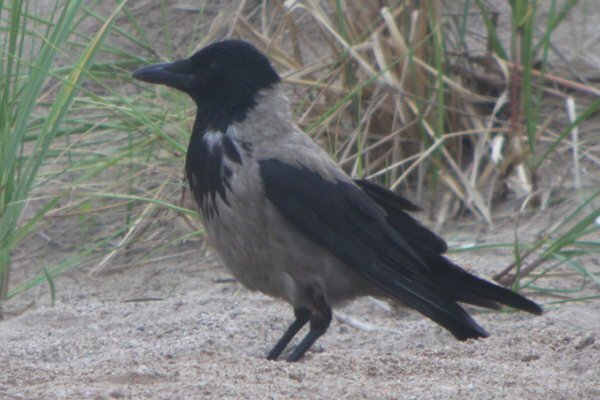 Prior to that trip to Kazakhstan the only other time I had seen Hooded Crows was in Germany in 2007, when my best looks at a Hooded Crow were along the shore of the Baltic Sea. I thought that by going to see this particular bird in Staten Island’s Great Kills Park I might not only get to see a great bird but might also evoke some nice memories as well. This is why I found myself driving on the westbound Belt Parkway this afternoon on my way to the Verrazano Bridge in order to get to Staten Island. Happily for me the traffic wasn’t heavy and I made it to Great Kills Park in almost no time. After parking and walking the last stretch along the gravel road to the (parking permit required) fishermen’s parking lot I was disappointed but not surprised that the bird was not immediately present. A couple of other birders were around and it didn’t take long for what is potentially the first accepted record of a Hooded Crow in North America to show, much to our delight. It flew to the beach and we followed and I was pleased that the bird’s behavior and appearance as it foraged in the wrack line strongly matched what I remembered from Germany four years ago. Later it flew back to the parking lot, harassed by Northern Mockingbirds the whole time, and eventually it took cover in the trees by the lot. I stuck with the bird until Seth and Isaac arrived and enjoyed watching it, even if all it did was sit in a tree and hide from mockingbirds. What a great bird and well worth the drive to Staten Island! You have patiently sat through enough text now, I guess, so let’s move on to some pictures, shall we? If you are thinking about chasing this bird I highly recommend it. 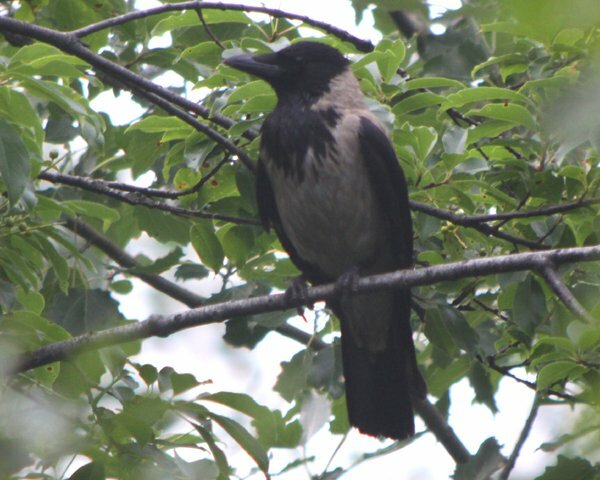 Hooded Crows are awesome creatures and seeing one in the United States is an opportunity that doesn’t come along very often. Get to Staten Island, posthaste! *Nate has a good rundown of the history of Hooded Crow records in North America. What a fantastic find! Beautiful bird, way out of its range. I’m so glad you took a chance and drove over the Verranzano Bridge for such an opportunity. Those are my old stomping grounds from more than 40 years ago, so it is doubly grand that you had such a sight there. This is really incredible! Yesterday for my post I sketched a Hooded Crow for the first time – I have an art site that focuses on a daily sketch of birds I appreciate . I saw them in India and fell in love but have never sketched one before. It would be great if you wanted to take a look at my site, I may use your photos as the inspiration for tonite’s post too. Your photos are wonderful! Thanks for sharing your experience. The provenance is definitely suspect, but I’m hoping I can sneak over there early Saturday morning. Damn busy weekends!!! Very nice find. They’re a common yard bird here in Ireland. What a cool bird to see in New York! My friend found one at the Jersey Shore August 11th!